Defensive end Mario Williamsarrived for the start of the Buffalo Bills offseason voluntary workouts Tuesday pleased to learn he’ll have one less burden to lug around this season. The Bills are finally entering the digital age after each player was presented a brand new iPad, which will store the team’s hefty playbook. More intriguing for Williams is what that game plan will resemble with Mike Pettine taking over as defensive coordinator. As part of rookie coach Doug Marrone’s new staff, Pettine’s preparing to bring to Buffalo the aggressive approach he was known for running during his previous four seasons with the New York Jets. And if that wasn’t enough, Williams learned shortly after finishing his workout that the Bills added depth to their defense by signing versatile free-agent lineman Alan Branch to a one-year contract. Williams has much to prove after failing to play to the high expectations he raised after signing a six-year, $100 million contract in free agency a year ago. Hampered by a sprained left wrist that required surgery in October, he finished with a team-leading 10 1/2 sacks. But he was part of a defense that was among the NFL’s worst and contributed to the 6-10 finish that led to Chan Gailey being fired. Chalking up last season’s struggles to a ”learning experience,” Williams dismissed the perception that Buffalo finds itself in the midst of another offseason of transition. The Bills are an unknown quantity under Marrone, who was hired after spending four seasons turning around Syracuse’s struggling football program. On Tuesday, Marrone got a chance to address his new players in person for the first time since he was hired in January. After spelling out his ABCs to the players, Marrone was short on providing details on the status of Buffalo’s QBs. He declined to talk about the addition of free-agent quarterback Kevin Kolb because the sixth-year player had not yet officially signed a two-year contract he reached on Saturday. Numerous media outlets, including The Associated Press, reported the former Arizona Cardinals starter had agreed to a deal with Buffalo. Though it’s unclear when Kolb will sign, he will be competing with Tarvaris Jackson for the starting job that was left vacant after Buffalo released Ryan Fitzpatrick last month. Numerous Bills players credited Marrone and his staff for making a good first impression by having an upbeat approach. Also not lost among the players were a few cosmetic additions to the team’s fieldhouse. The Bills, who haven’t made the playoffs since 1999, have hung large banners on the walls of each end zone celebrating their four AFC championships and two AFL titles. There’s also a 20-foot poster of the Lombardi Trophy attached to one wall. NOTES: Branch, listed at 6-foot-6 and 325 pounds, is entering his seventh NFL season after spending the past two as a starter in Seattle. He played four seasons in Arizona after being selected 33rd overall by the Cardinals in the 2007 draft. … Last year, Gailey was intending to have the playbook stored on iPads for this season because the NFL was switching its game video to high definition. … On Tuesday morning, Buffalo re-signed backup running back Tashard Choice, and tight end Dorin Dickerson has accepted the team’s tendered contract offer. also is sidelined until May after straining his right wrist swinging a weighted bat during warmups for the World Baseball Classic. “Those are two guys you can’t replace. 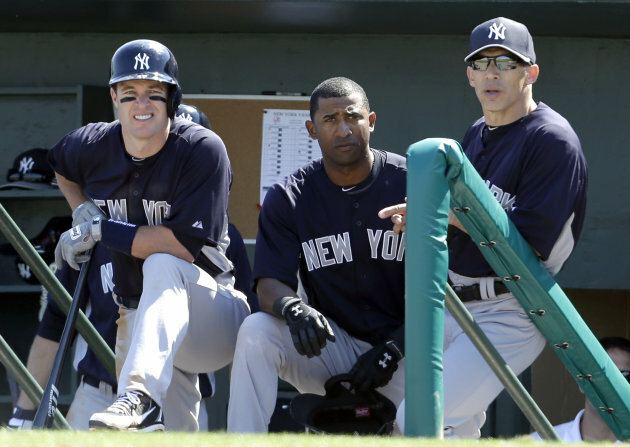 I mean, let’s get serious,” outfielder Brett Gardner said. Reliever David Robertson has a sore shoulder, the result of sleeping on it wrong. And the topper seemed to come when general manager Brian Cashman broke his leg while skydiving in Florida. The offer might stand for the rest of the AL East champs, too. The 38-year-old Jeter still hasn’t played in a spring game while rehabbing from his broken ankle in the AL championship series sweep by Detroit. The 40-year-old Pettitte was hobbled for nearly three months last season due to a broken leg. And the Yankees’ longtime savior, 43-year-old closer Mariano Rivera, is expected to announce Saturday that this will be his last season. He missed most of last year after tearing up his knee. Not a lot of wiggle room for manager Joe Girardi’s bunch as opening day approaches, on April 1 at Yankee Stadium against the revamped Boston Red Sox. “A lot of times, you look at injuries, you never want to see them. But I’ll take an injury now going into the season rather than later in the season,” newcomer Kevin Youkilis said. “The good thing is, you don’t win or lose a season in April. You win or lose seasons in September. For me personally, there’s been teams that are in first place every year in April and a lot of times they never make it all the way through,” he said. Normally one of baseball’s biggest offseason players, the Yankees had a real quiet winter while trying to keep their payroll at about $200 million. Rather, they watched their roster take quite a few hits. Rafael Soriano, who posted 42 saves while filling in for Rivera, signed with Washington. Postseason star Raul Ibanez left, as did starting catcher Russell Martin, popular right fielder Nick Swisher and valuable Eric Chavez. For a team that often relies on power, that’s quite an outage when coupled with the injuries to Rodriguez, Granderson and Teixeira. Put it this way: Of the 10 players who reached double-digits in home runs last season, only Robinson Cano and Jeter will be on the opening-day roster. A big step forward would be a complete recovery by Jeter. The surgeon who repaired his ankle gave the star shortstop full clearance this week to resume all activity. “It’s always reassuring when someone says that something is not broken anymore. So, it’s just getting through the normal aches and pains that come around it,” Jeter said. The Harbaugh brothers have spoken since Super Bowl XLVII. San Francisco 49ers coach Jim Harbaugh said this afternoon that he was the one who picked up the phone and reached out to Baltimore Ravens coach John Harbaugh. Surely, there was a congratulations in there somewhere. “Talked a little about the game and some other things,” Jim Harbaugh said at Lucas Oil Stadium. “Don’t think (the Super Bowl) affects (their relationship), other than stronger. Jim Harbaugh said he didn’t get any special insight from his brother about the game. The topic of their relationship was the first thing that was raised in his press conference. The spotlight is still shining brightly on their relationship and the unique situation. Jim Harbaugh made it clear it wasn’t any easier losing the game to his brother and said they share less strategy now than they did when he first joined the NFL ranks as a head coach. When top-ranked Baylor and third-ranked UConn met Monday night in one of the most anticipated games of the women’s college basketball season, the showdown delivered more than just a potential national championship preview. It also produced one of the most bizarre photos of the season. AP photographer Jessica Hill captured a shot of UConn coach Geno Auriemma patting Baylor coach Kim Mulkey on the backside before the start of the Bears’ impressive 76-70 road victory. Everything about the photo is memorable, from Mulkey’s stance, to Auriemma’s laser focus, to the giggling assistant coaches in the background. Thankfully, the Connecticut Post’s Rich Elliott asked Auriemma about the exchange after the game and got an explanation for the unusual scene. Auriemma clarified it was a lighthearted, harmless moment between two longtime friends. Very true. If the UConn and Baylor men ever play, Kevin Ollie and Scott Drew probably won’t share a pregame exchange quite like this. Gareth Bale inspired Wales to a 2-1 win over Austria in their friendly at the Liberty Stadium. Bale set Wales on their way with the opener in the first half before creating the second for half-time substitute Sam Vokes early in the second half. Marc Janko set up a tense finale by pulling a goal back for Austria 15 minutes from time, but Wales held on for a morale-boosting win ahead of next month’s World Cup qualifying double-header against Scotland and Croatia. Austria almost got off to a flying start after just three minutes when Adam Matthews had to be alert to clear Marko Arnautovic’s effort from a corner off the line. Craig Bellamy, who has missed Wales’ opening four World Cup qualifiers, had a chance to open the scoring on 16 minutes when he latched onto David Vaughan’s pass, but the Cardiff forward failed to hit the target. Wales made the breakthrough on 21 minutes when man of the moment Bale netted his 10th international goal for his country. Liverpool midfielder Joe Allen picked out Bale with a fine through ball and the Spurs ace took the pass under control before firing home past Robert Almer in the Austria goal. Wales had a lucky escape just past the half hour mark when West Ham new boy Emanuel Pogatetz bundled the ball home from Janko’s header, but the goal was controversially ruled out for offside as replays showed it was the wrong decision. The dangerous Arnautovic then forced Boaz Myhill into a fine save with a fierce swerving shot from distance on 36 minutes. Austria were unlucky not to draw level on the stroke of half-time when David Alaba saw his stunning volley come back off the post with Myhill beaten. Wales doubled their lead on 52 minutes when Bale turned creator to cross for substitute Vokes to powerfully head home. Austria pulled a goal back 15 minutes from time when Alaba and Arnautovic combined and the latter crossed for Janko to head home at the far post.